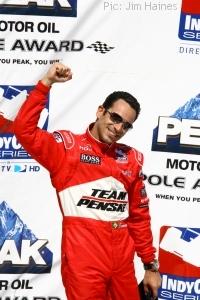 Not even the destruction of their first-choice race cars in a fire could stop Helio Castroneves and Ryan Briscoe from seizing the front row in qualifying for the Indy Grand Prix of Sonoma County. The Team Penske pair won out from a Firestone Fast Six pole shoot-out session that also included Will Power, Tony Kanaan, Scott Dixon, and Oriol Servia. Justin Wilson will start seventh, having failed to make the Fast Six for the first time this season. Castroneves and Briscoe can hardly be said to have had an ideal preparation for the race – a Penske team transporter was destroyed by fire as it drove through Wyoming on its way from the team’s base in North Carolina to the Infineon Raceway in California. Pit equipment and team uniforms went up in smoke, but the biggest casualties were two race cars set up for road courses. The team was left scrambling to adapt two more chassis – with obvious success. The Penske drivers have now started first and second at the last three road courses – but it’s Target Chip Ganassi’s Dixon who seems on the verge of clinching the championship. He leads by 78 points from Castroneves, who has failed to win a race all season. Kanaan and Dixon’s team-mate Dan Wheldon are the other two drivers in with a mathmatical chance of winning the championship, 138 and 147 points back. But with just three scoring races remaining – counting Infineon – the title is Dixon’s to lose. Wheldon has a tough race ahead, failing to make it through from the first session of qualifying and landing himself 16th in the 27-car field. Wilson was another driver who felt he hadn’t quite managed to get the best from his car. He said: “The McDonald’s car was quick but just a little difficult to drive. It was right on the edge all the way around, so we couldn’t quite put a lap together. I think we have the performance to gain some spots, but I don’t think this track lends itself to overtaking. Darren Manning qualified 21st, at the head of a four-car group of potentially quick drivers that also includes Buddy Rice, Ed Carpenter and AJ Foyt IV. Categorised under IndyCar Series, tagged under Dan Wheldon, Darren Manning, Helio Castroneves, Indy Grand Prix of Sonoma, IndyCar Series, Justin Wilson, Ryan Briscoe, Scott Dixon, Team Penske, Tony Kanaan, videos.